For over 100 years, Joliet has been one of the busiest locations in the Midwest -- see the History Page. In the 21st century, Joliet is still one of the most active places to catch modern railroad action. ​Running north-to-south, tracks 1 and 2 (former Santa Fe) belong to BNSF's Chillicothe Subdivison, while tracks 3 and 4 (former Alton/GM&O/ICG) are used by Union Pacific's Joliet Subdivision and CN's Joliet Subdivison. Metra's Heritage Corridor trains and all Amtrak trains use tracks 3 and 4. 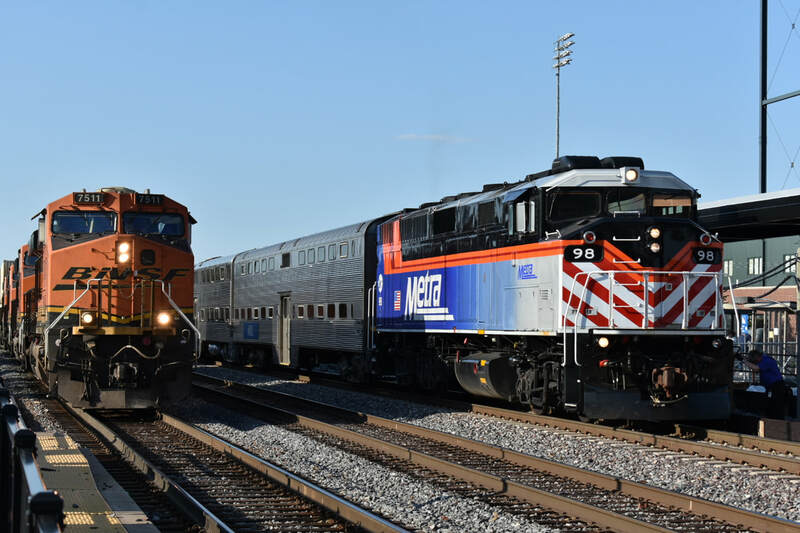 Freight traffic through Joliet is mostly intermodal, containers and trailers, along with auto racks, refrigerated cars, chemicals and general freight for local industries. Large petrochemical facilities to the north and south bring in a steady supply of tanks and covered hopper cars. Massive intermodal facilities to the north and south of Joliet generate considerable traffic. Union Pacific used to run unit coal trains to local power plants south of here, but these facilities are in the process of being converted to natural gas. ​The single remaining track running east-west (former Rock Island) is used by Metra's Rock Island District trains up to just short of the crossing. CSX's New Rock Subdivision freight trains to Utica, Illinois and Iowa Interstate freight trains to Peoria, the Quad Cities and Council Bluffs, Iowa continue over the crossing, then over a massive lift bridge across the Des Plaines River, as they head westward. Most of this freight traffic tends to run at night, but can also appear during daylight hours. 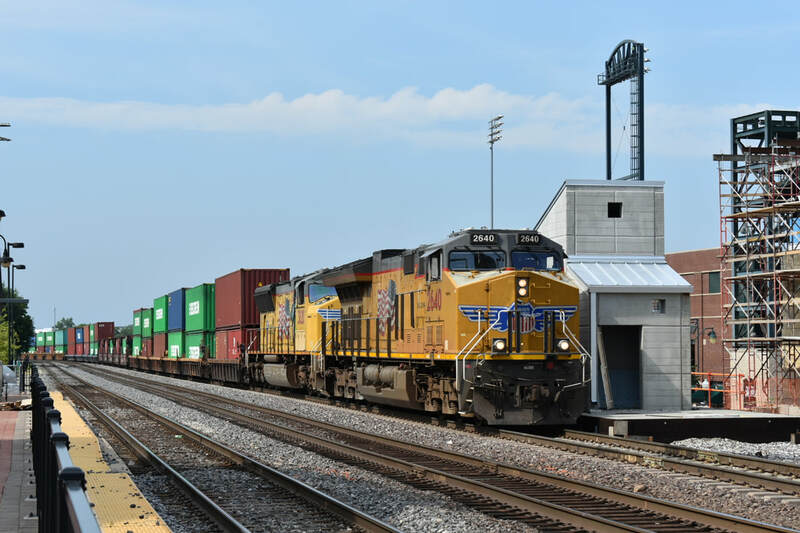 CSX's New Rock Subdivision trains service many chemical facilities in the area, as well as massive sand operations in and around Ottawa, Illinois. The IAIS also runs ethanol trains (sometimes with Norfolk Southern power) from Cedar Rapids into Chicago on this line. 160.650 MHz [AAR# 036] - BNSF Ry. Passenger operations are detailed in our Passenger Guide to Joliet Union Station. Metra maintains a coach yard just east of the Rock Island District platform, and although inaccessible to the public, it can be seen from public streets. Metra uses the former interchange track between the Rock Island and GM&O as a connection to bring Heritage Corridor trains in and out of the coach yard. The former Elgin, Joliet & Eastern (now Canadian National) East Joliet yard and the crossing of the "J" and the former-Rock Island are about 1.5 miles east of the Joliet Union Station, but are both generally inaccessible from public areas. Several miles south of downtown Joliet, BNSF and UP maintain two separate and massive intermodal yards. Union Pacific's Global IV is located just to the west of the Chicagoland Speedway race track, while BNSF Logistics Park Chicago is next to the small town of Elwood. Both are part of the redevelopment of the former Joliet Arsenal land, which also includes the Abraham Lincoln National Cemetery and the Midewin National Tallgrass Prairie. The original 1912 station no longer serves passengers, but a metal fence has been built around the original station platform, short enough for photography and the platform is open to the public and accessible by stairs. The former waiting room is now a banquet facility and a brew pub moved into the ground floor in 2017. The renovations for the microbrewery have altered several features of the historic station building, including the original express and baggage areas as well as the courtyard entrance and driveway. After four years, the waiting room building for the Joliet Gateway Center is now open. The City of Joliet provides security. The original UD interlocking tower, formerly staffed by Metra (and previous to that Rock Island) has been closed and the signaling and control functions have been automated and transferred to Union Pacific in Omaha and BNSF in Fort Worth. (The control point is named "UD Tower.") The tower building was kept in place, and the contents of the tower are being preserved, with the city working on turning the tower into a museum and viewing platform.